It's the first day of September, and pretty soon Fall will be here. And you know what that will mean...varmint hunting season. 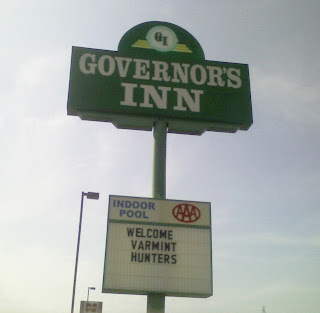 That's right, and the good people at the Governor's Inn in Pierre, South Dakota, are already atwitter with expectation. Yosemite Sam, here we come! Much thanks to Nick Zachariasen who has once again provided us with a Gallery entry. Perhaps I should begin calling this Nick's Gallery of the Absurd. Oh varmints. Those lovable animals we hunt for no reason.